The R-Strap is the innovative camera strap. This patent-pending equipment offers unparalleled peace of mind and ease of access to your camera. 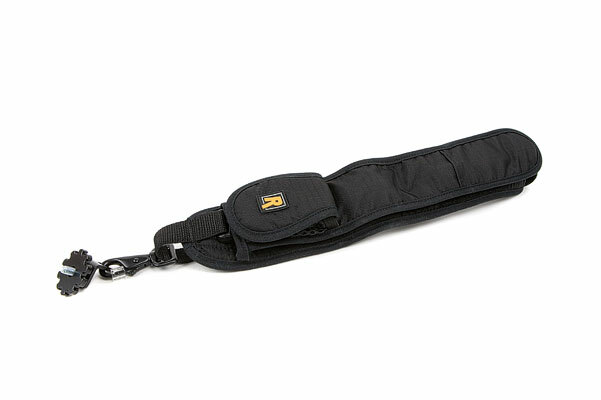 The R-Strap is worn diagonally across the torso from shoulder to hip and is adjustable to fit most photographers. The pad has a mesh underside for comfort and breathability. Our locking FastenR connects the R-Strap to the tripod socket located on either the camera body or the lens. Once connected, the camera hangs upside down, resting securely at your side or in the small of your back, with the lens pointing behind you. With the camera at your hip or behind your back, you can maneuver easily through a crowd, carry a tripod or other gear, or simply have both hands free.